The article used the green cleaner category to illustrate how, during the recession, so-called mainstream consumers’ “love affair with green products…has faded like a bad infatuation.” Yet buried in the article was this chestnut: the market share of independent brands like Method and Seventh Generation is starting to increase relative to, say, Clorox’s Green Works and S.C. Johnson’s Nature’s Source (See Method’s take on this in Fast Company here). What’s going on? Consultants and pioneers like Terracycle’s Tom Szaky and Method’s Eric Ryan have been quick to seize on the “authenticity gap.” Only inauthentic ecofriendly cleaning products are failing; their “Light Green” consumers are more fickle, more price sensitive, not truly committed to the sustainability movement. By contrast, “Dark Green” consumers are more educated, more committed, more affluent and thus more inclined to stick with “pure play” brands that deliver both value and values. At our brand innovation shop, we know–based on our research and experience–that “Dark Green” consumers will never take sustainability to scale. There simply aren’t enough of them. And we’ve always asserted that U.S. consumers are unwilling to pay more for greener products. So how might products from major brands like Arm & Hammer, Windex, Palmolive, Hefty and Scrubbing Bubbles close any authenticity gaps? And what are the lessons for companies looking to successfully introduce new products with environmental benefits? They Deliver Value. First, they match conventional brands on functional benefits like price, performance and availability. Consumers–regardless their level of commitment–don’t want to compromise on practical benefits. They Demonstrate Values. Sustainable brands have a real point of view. They care about health and safety. They care about transparency (and actually disclose their ingredients). They care about a world of stakeholders, not just shareholders. They Cultivate Community. Sustainable brands foster meaningful connections with their like-minded, like-hearted consumers. Method boasts some 9,400 followers on Twitter while Clorox Green Works has about 600. In branding, the Law of Authenticity asks whether your brand reflects who you are and what you do. Brands like Clorox Green Works are fairly accurate extensions of their parents: long on value, short on the demonstration of values and largely absent real community. In that sense, they’re quite authentic. But by size and design, multinational consumer packaged goods (CPG) companies are challenged to develop, launch and build sustainable brands (which is why they usually acquire them: Ben & Jerry’s, Tom’s of Maine, Burt’s Bees, Naked Juice and so many others). The products that emerge from within start with a different premise, where productivity is paramount, and thus often fail to meet the principles above and fail to connect with New Consumers– those more than 70 million shoppers who care about “purchasing with a purpose” and whose support is critical to any authentic green brand’s success. Green Works employs experts like Carter Oosterhouse to dish clean living tips. Method showcases real employees and real consumers. 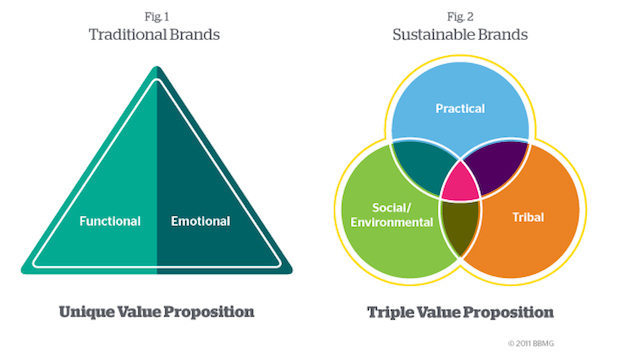 Going forward, the CPG companies that succeed in sustainability will embrace a new values-driven branding paradigm we call the Triple Value Proposition. This new paradigm moves beyond the old brand pyramid with its limiting functional/emotional benefits for a more dimensional framework that holistically engages practical, social/environmental and tribal benefits. It gives brand teams a way to authentically embed sustainability rather than engaging in “stick-on” cause marketing. Adopted as a new methodology and approach, it closes the gaps between strategy, sustainability, and brand marketing functions. It connects the consumer-facing story with an authentic corporate back story and focuses on empowering consumers rather than simply pushing products. It doesn’t create marketing campaigns so much as it fosters movements on the issues that matter. At the end of the day, generational and technological shifts are radically altering the way we create and consume goods and services. Given the urgency of the issues at hand (water, waste, energy, climate, population growth), sustainability is both an innovation imperative and a tremendous economic opportunity. Twenty-first century brands will not only internalize this fact; they will prosper significantly from it while connecting with consumers and being a force for good.